The 64MB onboard RAM on the X-Fi Fatal1ty FPS and the X-Fi Elite Pro sound cards is called X-RAM. There are two benefits from X-RAM. The first one being the possibility to use higher quality sounds thanks to having the extra memory on the sound card itself. The other benefit is the ability to decompress compressed sounds into the X-RAM saving CPU cycles. X-RAM is not recommended for streaming. It should not be used for storing constantly changing contents. Developers wishing to utilize X-RAM in their own software applications must use Open AL. A game which makes use of Open AL does not require additional function calls. By default the X-RAM extension is set to automatic, all Open AL buffers will be loaded into X-RAM as long as there is storage space left. This means that if a game is using Open AL it makes use of X-RAM as soon as it has been detected on your sound card. The X-RAM extensions can also be set to manual (hardware or accessible). In this mode it is up to the game developer to decide what sounds will be uploaded to the X-RAM. Creative Labs promises a performance increases in games thanks to a re-architected audio processing engine and the use of X-RAM. To showoff the power of the X-Fi Unreal Tournament 2004 has been modified to support 128 voices (compared to the maximum number of 64 voices in the retail version). Obviously this version of is not available anywhere and probably won't ever be. Various hardware sites have tried to reproduce that performance increase by comparing the X-Fi card to other sound cards with no luck. In games like DOOM 3, Battlefield 2, Comanche 4, Splinter Cell, F.E.A.R., Call of Duty 2, Chronicles of Riddick - Escape from Butcher Bay, Counter-Strike: Source and the benchmark tool 3DMark03 the results did not show any significant benefits when it comes to the framerate. But it has to be said that even though there has not been any visually noticeable increase the sound quality was better, the number of effects and maximum number of voices were higher. Games like the Battlefield 2 expansion Battlefield 2: Special Forces and Quake 4 fully support X-RAM according to the official SoundBlaster site. It is nowhere stated that Battlefield 2 was build with X-RAM in mind. Not on the product information page nor in the interview with the developers. 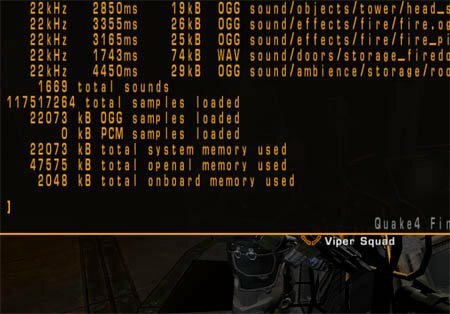 In Quake 4 you can get detailed information about what sounds have been loaded, into which memory they have been loaded and how much memory they actually use. This screenshot was captured on a system equipped with a X-Fi XtremeMusic. It seems logical for future titles to make use of the extra onboard RAM on a sound card. Not only will it free up some of your system RAM it might also be used to store uncompressed sounds which in previous generations had to be decompressed in real-time using CPU cycles. So far nothing has been confirmed but it is safe to assume that upcoming DOOM 3 engine based games like Enemy Territory: Quake Wars, the next Wolfenstein installment or Prey will make use of X-RAM since it is already implemented into the engine. Also other games using Open AL like Unreal Engine based games should without any problem include support for the extra RAM. hardly find any difference. maybe for far-future games. It does a difference when you are programming, my latest game uses OpenAL and by default it puts everything into the X-RAM first. It makes a difference in FPS then. I've been looking for info on X-RAM and luckily I ran into your blog, it has great info on what I'm looking and is going to be quite useful for the paper I'm working on. Good information about X-Ram V Basic. Thanks a lot for sharing this information keep posting such a nice post. That's some great techie information you got there. Thanks for the informative post on X-RAM! So informative and unknown informational blog this was and I'll so glad to read this blog. What Info Do You Have about Therapy with Viagra Online? Not so many guys with erectile dysfunction realize that Cialis online can assist them. They may purchase Cialis or Viagra Online and solve their troubles. what you have write and shared here is really great..I think you did a fantastic job by sharing your thoughts here. The difference between the two is not so big.Creat article about X-Ram.